Buphthalmum or Ox Eye, is a hardy perennial plant, member of the Daisy family, Compositae. Native to parts of Europe and Asia, they are closely related to Helichrysum, the Strawflower. 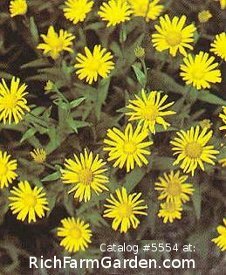 They have large heads of long lasting yellow daisy like blooms and make supurb border plants for the garden or color for the cottage garden. The plants thrive in well drained ordingary garden soil.